Paint a circle with gold glitter paint at the top of the head for a halo . Paint the details on the face with a toothpick. Our Macaroni Angel !! We made many that year and have passed them out to friends and family. They make wonderful package toppers too! I hope you Love her as much as we do. 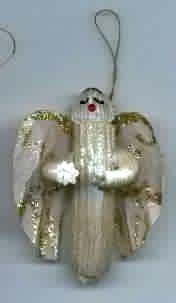 She also has a companion Santa Ornament located at my craft closet site noted above.